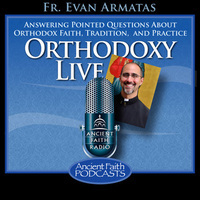 Non-stop calls tonight with questions ranging from free will to groups known as the "True Orthodox" and their claims. Fr. Evan continues his introduction of the Transfiguration. On August 6, we will celebrate the Transfiguration of our Lord, and Fr. Thomas Hopko helps us understand the pivotal nature of this event in Christian history.